Open wine bottles like a Sommelier and flip beer bottle tops for fun with this easy to use bottle opener. If you love entertaining at home you know how frustrating broken corks, chipped bottles and spoilt wine can be. Well now you never have to worry about these problems ever again. * QUALITY CRAFTSMANSHIP - beneath its glossy shell, the handmade quality with stunning precision provides a corkscrew that is designed to last a lifetime. 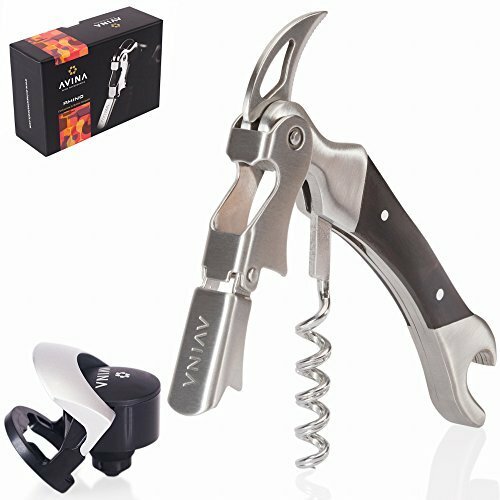 * DISTINCTIVE DESIGN - stylish and ergonomic this wine opener has been made to perfectly match the ergonomics of your hand. The integrated beer bottle opener makes this a great compact bar tool. * BALANCE PRINCIPLE WEIGHTING - beautifully balanced & obsessively engineered to be a precision powerhouse, this corkscrew combines raw strength with symmetry & accuracy. Ingenuity, so less force is needed to remove corks. * TESTED FOR SAFETY - the stainless steel lever provides amazing stability, reducing the necessary force between the lever and bottle, which eliminates almost all possible bottle or cork damage. * BONUS WINE STOPPER - this Waiters Friend comes with a leak-proof wine stopper saver to easily cork open bottles. This wine accessories gift set is perfect for any wine enthusiast or wine lover. AVINA bottle stoppers are designed to work with over 90% of wine bottle sizes, but we can't guarantee it will fit all. *This wine bottle stopper is not suitable for most Champagne, Cava, Prosecco or Sparkling Wines. At AVINA, we want all our customers to be completely satisfied, so we introduced our 'You Break It, We Replace It' scheme. Once registered, if you subsequently break your Corkscrew we replace it free of charge, see pack for details. Your complete satisfaction is important to us. If you have any questions about this product by AVINA Wine Accessories, contact us by completing and submitting the form below. If you are looking for a specif part number, please include it with your message.